Price is per long 35-inch strand of these beautiful beads. Average largest size measures about 11mm x 7mm x 6mm. Glass beads are very popular for necklaces, bracelets, anklets and piercing. They are also popular on lamps, head caps and tiaras. Because glass is a cheaper alternative to crystal and more available. There are also many more shapes, styles and colors available in glass beads than there are in crystal beads. These shapes can range from simple designs for example spheres, teardrops and leaves to original and obscure designs that can be indescribable. Glass beads are available in a variety of colors like primary colors of red, green, and clear to more sparkling colors of aqua, magenta and rose. Many are multicolored with a blow effect as can occur on glass vases and beakers. Glass beads, especially when making jewelry items can be mixed with other beads on the thread. The mixture depends on the role of the item. A formal necklace may incorporate a few crystal beads threaded with the glass beads to give an impression of expense and class. However, a more casual look may prefer to incorporate shells or seed beads instead. Most glass beads are made out of matt glass, dichroic glass and lamp worked glass. These regular forms of glass beads are relatively cheap to purchase. 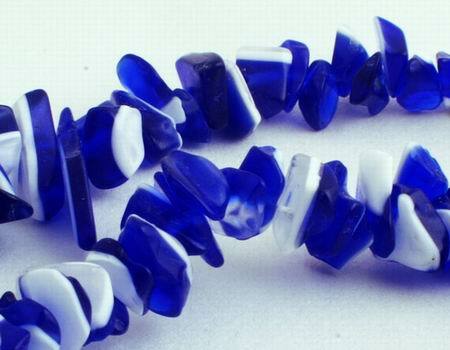 Glass beads are available from specific suppliers located in shopping malls and internet shops. The beads can usually be purchased individually, however the cost of the beads tends to fall the more beads that are purchased. Glass beads can also be found in rare forms of vintage glass. These glass beads are usually from Germany, Japan, Italy and Czechoslovakia. These vintage beads are usually hand made and therefore more expansive and are common purchases for collectors or customers requiring a rare piece of jewelry to be made. Glass beads, as with many other beads are usually purchased ready holed and are thread onto either cotton or nylon threads.